Posted on June 7, 2016 at 7:08 pm. 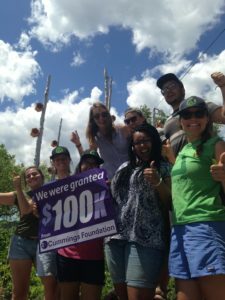 The 2016 Summer Crew Leaders and the South Street Farm mason bees get very excited for $100K for 100! Groundwork Somerville is one of 100 local nonprofit organizations to receive a grant of $100,000 through the Cummings Foundation’s “$100K for 100” program. The Somerville-based community organization was chosen from a total of 479 applicants during a competitive review process. Groundwork Somerville is dedicated to creating a greener, cleaner, healthier and more equitable Somerville, focusing on providing food, jobs and green spaces to promote environmental, economic and social well-being. Chris Mancini, Executive Director, and Clay Larsen, Projects Manager, joined approximately 300 other guests at a June 9th reception at the TradeCenter 128 in Woburn to celebrate the $10 million infusion into Greater Boston’s nonprofit sector. With the conclusion of this grant cycle, the Cummings Foundation has now awarded more than $140 million to local nonprofits alone. With these funds, Groundwork will create a world-class jobs network and training program for its established Green Team job corps, to prepare the next generation of environmental and social justice leaders. The “$100K for 100” program supports nonprofits that are not only based in but also primarily serve Middlesex, Essex, and Suffolk counties. This year, the program is benefiting 41 different cities and towns within the Commonwealth. Through this place-based initiative, the Cummings Foundation aims to give back in the area where it owns commercial buildings, all of which are managed, at no cost to the Foundation, by its affiliate Cummings Properties. Founded in 1970 by Bill Cummings of Winchester, the Woburn-based commercial real estate firm leases and manages more than 10 million square feet of space, the majority of which exclusively benefits the Foundation. This year’s diverse group of grant recipients represents a wide variety of causes, including education, homelessness prevention, elder services, healthcare, and food insecurity. Most of the grants will be paid over two to five years. The complete list of 100 grant winners is available at www.CummingsFoundation.org. Groundwork Somerville creates jobs, food, green space, and leadership opportunities for environmental justice communities and individuals, through programs that address areas of healthy education, green jobs and sustainable communities. We work with children and teachers in school garden classrooms to connect experiential learning to state curriculum standards, and young people to their environment; we provide jobs and leadership training to low-income and underserved youth in our community; and we are stewards of 31 sites throughout the region, which we maintain, cleanup, and grow food in, including the South Street Farm – Somerville’s first urban farm; the Mystic River; and 10 Garden Classrooms in every elementary school in the city. 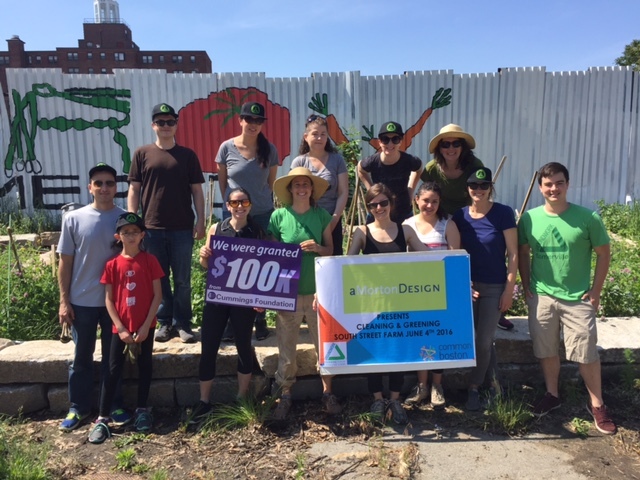 Volunteers at the South Street Farm celebrate “$100K for 100” from Cummings Foundation with Groundwork staff and youth in June. The Cleaning & Greening event was sponsored by aMortonDesign.